In 1991 Kurt was in a motorcycle accident. As a result, the mobility in his right ankle was severely hindered. For twenty years following the accident, he coped with recurrent swelling and infections, while mobility continued to deteriorate. Increasing strengths of medication failed to manage the pain completely. And, the injury to his ankle restricted life for Kurt to two places: work and home (with the ankle propped up). In October 2010 Kurt entered Dr. Jan Ertl’s office in Indianapolis with the hope of finding a long term solution. Dr. Ertl listened to Kurt’s history and goals. After some discussion, the two men determined that the Ertl Procedure was right for Kurt, and the doctor gave him the name of 3 different certified prosthetists to call. In the days that followed surgery, Rob called Kurt at the hospital to lend expertise and set clear expectations. Three days after the procedure the pain decreased (just like Rob predicted) and Kurt began to feel hopeful. As healing continued, the team at SPS continued to be present. When the time came to check in with Dr. Ertl again, Rob was at the meeting. The three men (Kurt, Rob and Dr. Ertl) functioned as a team to insure Kurt’s best possible outcome. During the three months between surgery and fitting, Kurt questioned his decision to have an elected amputation, grew weary of crutches, and wanted to be free of the pain meds he had depended on since 1991. However, the pain he was feeling was less severe than the injury. There was hope. Goal One: Walk without pain. Goal Two: Stop taking pain medication. On March 17, 2011 Rob took an impression of Kurt’s residual limb for his new prosthesis. Two weeks later, on April 1, Kurt walked on his new prosthetic for the first time with the support of a cane. On April 6, Kurt took pain medicine for the final time in over 20 years. These were the first of many goals that Kurt, Rob and Dr. Ertl have reached together. Goal Three: Return to an active lifestyle. I want to run. As Kurt progressed and began to enjoy a natural, pain-free gate, his next goal kept surfacing. He wanted to run. Rob worked to get a running leg approved by insurance and surprised Kurt with the leg on January 25, 2013. Kurt now runs. He just finished his first 5K in 20 years. Today, Kurt enjoys being active. He has more energy to spend quality time with his family. 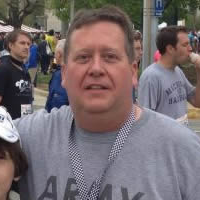 Kurt’s 13 year old is getting to know a dad that can get off the couch and engage in life. And, his grandchildren are enjoying visits to amusement parks with their grandfather. Up next, Kurt’s long-time dream of getting his pilot’s license is ready to take off. Without pain medications in his system, the FAA has cleared him to begin training.